There is a lot of fun to be found in the What If? series that Marvel has run on and off over the years, but this has to be one of the more fun that I have read. I am a huge fan of the Thor mythos in Marvel so I picked up this issue from my local comic shop just for the fact that it was a twist on my favorite character. However I never imagined just how much I would enjoy this take. It takes the long history of Thor in the Marvel Universe and puts one major twist into it. 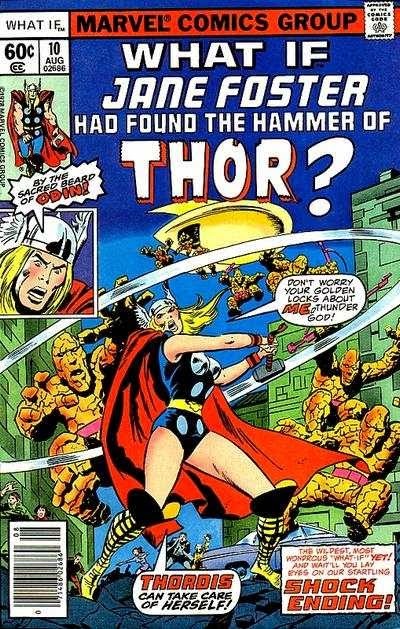 Jane Foster finds the stick inside the cave in Norway instead of Donald Blake, so she is given the power of Thor. Thus Thordis is born. From there on this issue tells the story of a lot of the big moments that have occurred in the pages of Journey Into Mystery and The Mighty Thor. You get to see her face off with the Radioactive Man, Lave Men, and even “her” half-brother Loki. But personal interactions make this story great. The way it changes the relationship between Blake and Foster for example. Donald Blake loves Jane Foster but won’t tell her because he is afraid it will guilt her into staying with him. Jane Foster just wishes he would own up to his feelings so they can be together. But by Foster becoming Thordis she and Blake fall away from each other. In the old comics Foster and Blake have quite the love throughout the years, and they are bound by the fact that Blake willingly gives up his identity to protect the world fro larger threats. I won’t ruin how all this plays out just in case anybody wants to track down this issue themselves, but it is really well written. Some other great moments come out of the other gods meeting Thordis. Like the Warriors Three squabbling over this new “fair-haired beauty” before them. Or Odin seeing his long banished “son” return as a woman. Probably my only problem with this story is how it turns Donald Blake into a real whiner at points. He often just complains about being a cripple, and how he is useless to anyone. I felt it kind of hurt the character, as well as setting a bad example for kids who may have read this issue when it first came out. What kind of message does that send? That if you aren’t perfect you are useless? I have grown up with many people in my life who were “handicapped”, while I didn’t always understand the situations involved, I now see that most of them are the closest to perfect people I know. Thanks for reading my blog. I hope you enjoyed it. if you have any comments or suggestions they are always welcome.